A steel-framed college campus forms a major element of Sunderland city centre’s regeneration. Martin Cooper reports. Steel tonnage: 900tA multi-million pound steel-framed vocational campus is being built in the heart of Sunderland to accommodate up to 2,000 students and more than 120 staff. Covering 12,500m², the state-of-the-art City Campus will house vocational courses, transferred from the nearby Hylton Campus, including advanced engineering, manufacturing, construction trades, automotive trades, travel and tourism, and catering and hospitality. The well-equipped campus will also feature hair, beauty and barbering facilities; a spa; a bakery; a travel agency; restaurant and a car repair service, all of which will be accessible to the public. Principal at Sunderland College Anne Isherwood says: “The City Campus has been designed to combine industry-standard facilities and outstanding teaching for our vocational and apprenticeship students, and will equip them with the skills and practical experience they need for their future careers. In order to achieve these aims, the Campus building’s design not only had to stand out within its urban surroundings but also maximise the space within its confined plot. Stone walls, polished blockwork and metal cladding will give the Campus a modern exterior, while to utilise the plot a steel-framed structure incorporating a 120m-long retaining wall was chosen as the best design choice. The retaining wall allows the steel-framed structure to adapt to the site’s tricky topography and thereby include a basement level along the entire south facing classroom block. “A steel-framed solution was selected for a number of reasons such as programme and cost. However the main driver was the flexibility that this provided for services distribution and for modification in the future. Many of the classrooms and workshops are heavily serviced and these require extensive ductwork for specialist equipment. If the location of these changed in the future, openings in floors and walls could be accommodated more easily with a steel-frame than a concrete structure,” explains WSP Parsons Brinckerhoff Project Engineer Andrew Cornwall. The steel-framed Campus consists of two teaching wings. Along the southern elevation there is the three and two-storey high classroom block, while to the north there is a two-storey Learning Resources Centre (LRC). Both of these wings are joined at the western end by a three-storey high entrance building that also incorporates an atrium. Because the Campus is essentially one large braced steel-framed building, a movement joint has been placed along the line where the LRC meets the entrance wing. 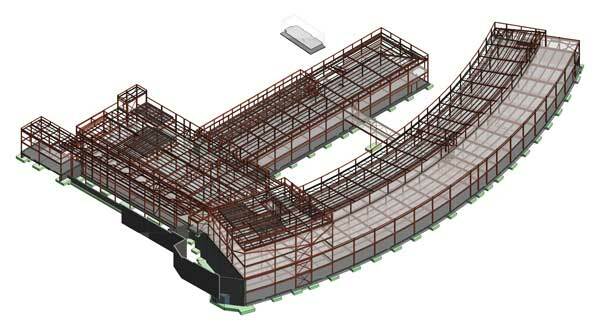 Bracing, located in stairwells, along with the diaphragm action of the composite floor slabs, give the steel frame its stability. Predominantly, the steel frame has been erected around a fairly standard grid that incorporates perimeter columns spaced at centres that vary from 6.5m up to 7.5m. Internal spans vary depending on the classroom or workshop’s ultimate use, with the longest span measuring 10m. The classroom block is the largest section of the Campus. Filling up the southern portion of the plot, it curves – via a faceted steel frame – along the site’s boundary adjacent to railway lines. This wing incorporates workshops and classrooms spread over basement, ground, first, and second floor levels. A 5m-high retaining wall wraps along the wing’s north elevation, incorporating the site’s slope and because of this the basement level workshops are at ground level along the south elevation and have windows overlooking the railway lines. Flexibility is at the forefront of the first floor’s design, as it is split lengthwise between classrooms on one side and an outdoor terraced green roof. “The terrace has been designed so in the future, if the college needs more teaching space, it could be roofed over and converted into classrooms,” says BAM Project Manager Jason Kelly. During the design stage the foundations and the columns in this part of the structure were future-proofed by being designed to accept the extra loadings the additional columns and a roof would exert. The western corner of the classroom block incorporates a second-storey, which then wraps around to the entrance block, which is entirely three-storeys high. As well as constructing the College, BAM Construction is also responsible for the fit-out which will be completed by the end of the summer, in time for the Campus to open in September 2016. Railway lines along one elevation and a city centre pedestrianized zone along another mean there is only one access route into the site for all materials. 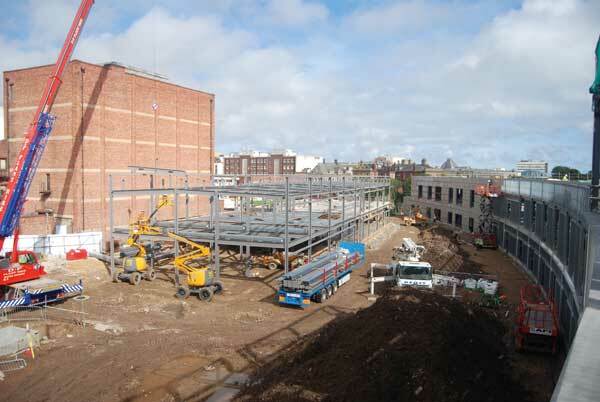 On a tight and confined site such as this, logistics are a key factor in successfully completing a project and Sunderland College is no exception. “Ideally we would have started the steel erection at the farthest end from the site’s entry point, which is the entrance block, and worked our way out,” says BAM Project Manager Jason Kelly. With little or no room for materials to be stored on site, especially towards the end of the steel erection programme, steelwork contractor Harry Marsh [Engineers] has delivered steel to site in 20t loads, which were generally erected in one day.